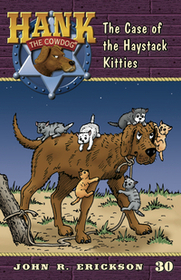 Hank has his paws full when he discovers a mother cat and six kittens trespassing in a haystack on his very own ranch. (Have we mentioned cowdogs don’t like cats?) Join Hank as he is trapped in a runaway pickup, surrounded by a herd of stray cats, and forced to battle a raging bull. Can Hank stop the cats from taking over his ranch?